Melia Cala Galdana is one of Menorca’s top hotels, set in a prized position right on Cala Galdana Beach, which boasts a Blue Flag award for its pristine golden sands bordered by towering white cliffs. Guests can take scenic walks along the coastal Camí de Cavalls footpath. The resort was completely refurbished in 2015 and features 341 tasteful, bright rooms with views overlooking the ocean. Enjoy easy access to the beach and a range of activities and evening entertainment. 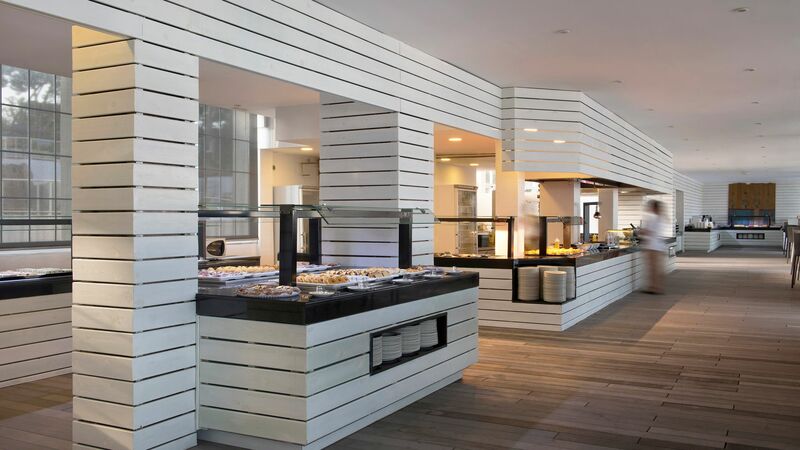 Dine at one of Melia Cala Galdana’s three restaurants, which offer Mediterranean and Italian fare, with buffets, and show cooking. If you’re holidaying as a family, take advantage of the kids’ clubs during summer season and child prices for two-to-11-year-olds. The Level service is ideal for a luxurious, adult-only getaway, offering access to the infinity pool with a concierge, snack bar, and Bali beds. You’ll also have exclusive use of a lounge with cocktail and aperitif service, a restaurant with a menu which changes daily, gym, and whirlpool. Hotel child prices apply to ages 2–11 years. The hotel has 341 rooms, 11 floors, and 4 lifts. Specially modified rooms for people with reduced mobility are available on request. Dine at Cape Nao for Mediterranean-inspired dishes that include the Menorcan lobster stew as well as seafood, burgers, sandwiches, and salads. The shady terrace lies just a few metres from the beach. Open: for lunch and dinner on selected dates in July and August. There’s no credit for half board guests. 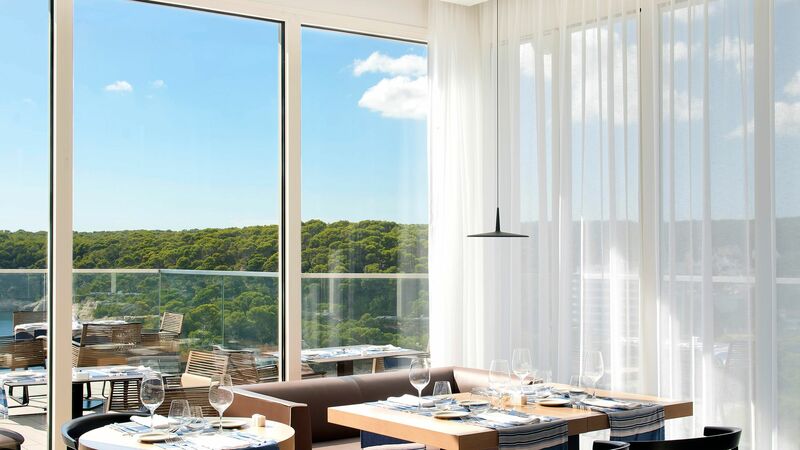 This restaurant opens for dinner only, serving modern Italian cuisine accompanied by superb views over the bay. Dishes include freshly-made pizzas from the pizza oven, as well as a buffet for starters and desserts. Guests staying on a half board basis can enjoy a discount and, if staying more than five nights, a free dinner at Casa Nostra. Mosaico offers diverse breakfast and dinner buffets, with a kids’ section, show cooking, and cook-to-order meat and fish stations. The restaurant roof opens up and there’s a terrace area with panoramic views of the bay. The restaurant is available for half board guests. The stylish Lobby Bar is the ideal place to relax with a beverage throughout the day and offers everything from tea and coffee to wine, beer, and cocktails. Melia Cala Galdana has a shallow kids’ pool, adult-only pool with waterfall feature, and a stunning infinity pool by the beach, which is available for The Level guests and by reservation. The hotel is situated right on Cala Galdana Beach, with a lift providing direct access. Relax on the soft, honey-coloured sands and in the warm Mediterranean waters, which have earned the beach a Blue Flag award. 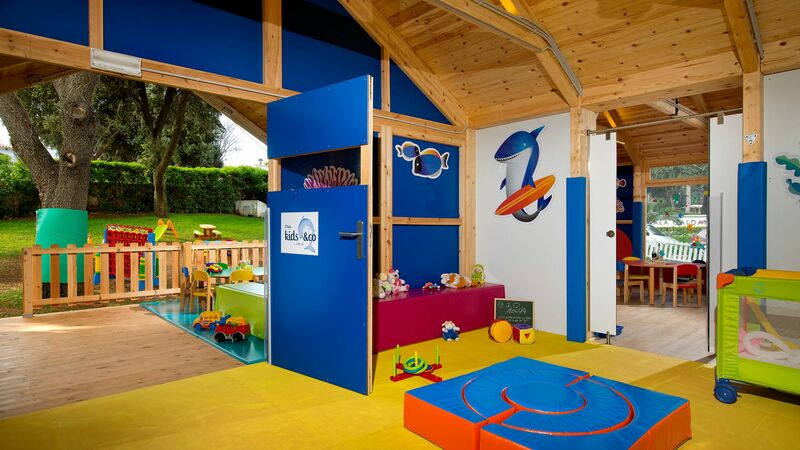 Children can take part in the hotel’s kids’ club, where professionally trained staff run a range of activities. These include arts and crafts, sports, Disney shows, and mini discos, as well as access to a play area, cinema, and bouncy castle. Expert staff will keep toddlers and babies comfortable and entertained throughout the day. There are special children’s menus, as well as activities, and games. Melia Cala Galdana has a gym with exercise equipment, a sauna and Jacuzzi. There are also a range of fitness classes to take part in such as yoga, Zumba, spinning, and body pump. Staff at the Melia Cala Galdana can arrange a variety of activities, such as mountain biking, scuba diving, and equestrian shows. Guests can also enjoy the entertainment programme which includes DJs and live music in the evenings. 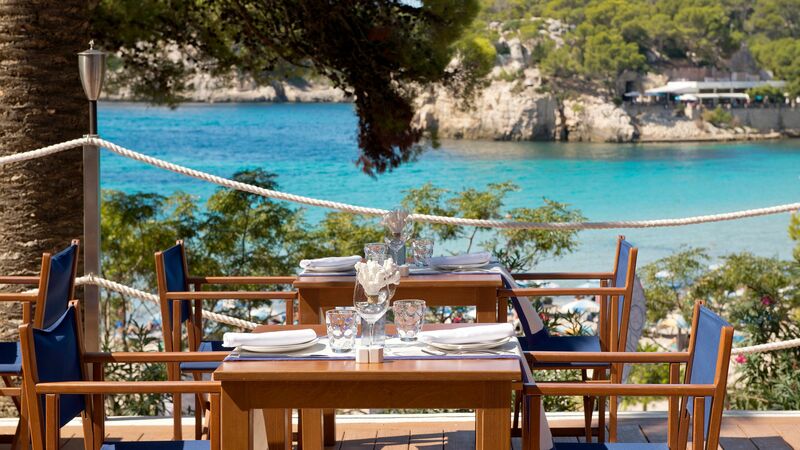 Melia Cala Galdana is nestled in the little bay of Cala Galdana, on Menorca’s south coast. It’s close to the pretty white sandy beach of the Balearic Sea and offers beautiful views. Spend the day relaxing on the beach, enjoying delicious fresh seafood in one of the restaurants or beach bars behind. Families will love the many water sports and activities available, including sailing, pedalo rides, and more. History lovers should head to nearby Ciutadella where you’ll find an old town filled with historic golden buildings and whitewashed restaurants. Alternatively, enjoy the restaurants and bars in Cala Galdana, or head to the capital, Mahon, for a further selection. 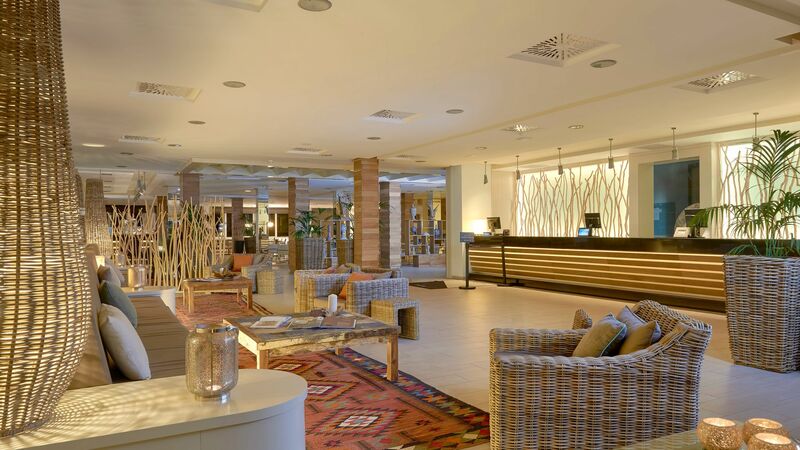 Melia Cala Galdana is a 30 minute drive from Menorca Airport. Double Melia rooms have a contemporary design with parquet flooring and feature two single beds or a double bed, shower, air conditioning, satellite TV, hairdryer, tea and coffee making facilities, minibar and WiFi. Some rooms have a sofa bed for a child. Double Melia Cala Galdana View are located on the first and second floors with views of Cala Galdana and feature either two single beds or a double bed, shower, air conditioning, satellite TV, hairdryer, tea and coffee making facilities, minibar and WiFi. Some rooms have a sofa bed for a child. Double Premium Cala Galdana have a prime location in the hotel with magnificent views of Cala Galdana and feature either two single beds or a double bed, shower, air conditioning, satellite TV, hairdryer, tea and coffee making facilities, safe, minibar and WiFi. Some rooms have a sofa bed for a child. Decorated in elegant and contemporary style, these rooms offer magnificent views of Cala Galdana. In addition to regular facilities, guests staying in these rooms have also access to the upgraded 'The Level' service, including exclusive access to The Level lounge, serving daily breakfast, aperitif service, cocktail service, dinner service and more. Save up to 10% discount for holidays between 15 July - 13 September 2019 booked by 30 April 2019. Save up to 20% discount for holidays between 14 September - 21 October 2019 booked by 30 April 2019. Honeymooners travelling between 26 April - 28 October 2019 for a minimum of 5 nights will receive a complimentary room upgrade to a Superior accommodation (subject to availability on arrival), a bottle of local Cava and fruit upon arrival, late check-out (subject to availability) and one dinner for two (excludes beverages). A copy of the wedding certificate must be presented at check in and should be no older than 2 months. We had a great holiday here for one week in early September 2018. The hotel has the best location on the island, right on the beach in Cala Galdana. The rooms have great views over the sea, but they are on the small side. On arrival we asked to see some of the level suites to possibly upgrade, however for the price they were also small, so we stuck with our original room. The breakfast food was varied and the positioning of the tables, with views out over the sea and the beach, was fantastic. The pool is at the back of the hotel catches the sun a lot of the day, and if you are friendly to the bar staff they are happy to bring you drinks over to your loungers. The restaurant at the top of the hotel has some really nice food, however the food at the restaurant on the ground floor was not very good. There are a few nice restaurants in Cala Galdana, however the food was probably the most disappointing part of the holiday in general. All in all a very well run hotel and definitely worth its high price tag compared to others on the island. I stayed here on my own on my first solo travel trip ever. It comes up expensive if you're not splitting the cost of the room, but quite frankly it's worth it. The hotel is beautiful, airy, light, got an up-market luxury to it. My room was great, I had a side view of the hills and sea. Room is pristine, really nice toiletries. Bar area outside is lovely, very cool Ibiza feel with excellent music. Free unlimited nuts with your drinks! The hotel is right on the beach and you have loads of cove hikes to do in the area. The breakfast (which was included) was delicious and the staff were so so so friendly. They helped me with my Spanish and were there for any questions I had. On check out day, there's a whole floor dedicated to private hotel rooms for you to change, shower and prepare for your journey which was a huge personal touch. Pool area was also glorious. The only negatives: My room was the first next to the lifts so it was a bit noisy in the morning and at night. Other than that, 5 star experience. Defininitely,the best hotel in Cala Galdena.Spectacular location right on the beautiful beach so make sure to book a room with a seaview.It makes all the difference! Some negatives,however.We arrived late one evening in Sept '18 as our flight was delayed.We received the bare basic information about the hotel from a not very welcoming guy at reception.We were offered no assistance in taking up our luggage to our room along what seemed an endless corridor.So poor first impressions! Breakfast is served until 11am, which is good, but the general buffet can be chaotic depending on the time you choose to have breakfast.Smaller buffet on The Level so a good idea to upgrade.Avoid taking a lounger on the beach as it costs 19 euros per day which is really crazy again we received no warning of this from the hotel. The big attraction is the proximity to the lovely beach and the spectacular views.Great beach bars and restaurants nearby.Overall a great holiday experience. We stayed in Melia Cala Galdana in the beginning of October and had huge expectations based on the reviews and pictures. And we couldnt really be happier staying in Melia! We had the Level service and were breathtaken already by checking in: the views from the Level lounge are sooo beautiful! The staff was really friendly and helpful and we felt very welcome all the time. The room was modern and clean and the towels were changed many times a day if needed. Again the views from the balcony - super! The Cape Nao beach club area was very peaceful and included free sun oils and water. The infinity pool was smallish and ice-cold but refreshing. 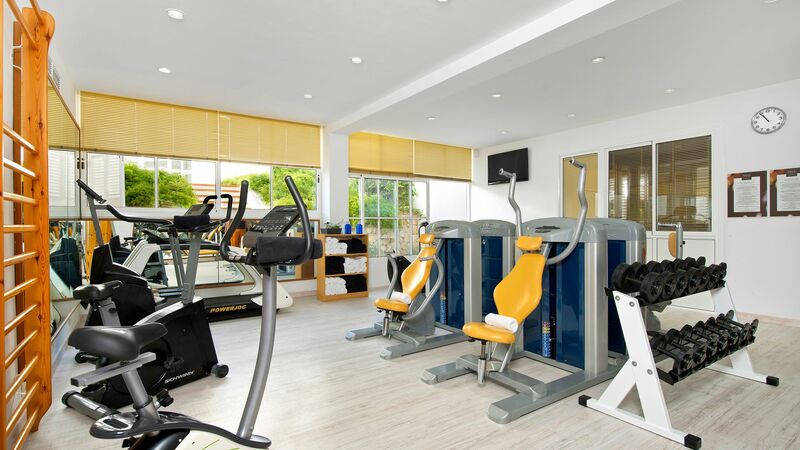 There is a gym in the hotel as well, small but modern and equipped well enough. What we loved the most was the food! We tried both breakfasts but decided to stick in with the Level because the normal buffet was super crowded and noisy. The Level breakfast was very peaceful and even though the buffet was smaller, there was everything we needed. Love love love for the fresh orange juice and ala carte option with all the tasty pancakes and waffles! There was also a midday complimentary hour of free cava, fresh fruits and snacks but what stole our hearts was the tapas hour at 5pm! Lovely small dishes, different each day, and delicious desserts, fruits, free cocktails etc.. As there wasnt so much to do in Cala Galdana we were really looking forward to this everyday. I think Melia Cala Galdana is overall great but booking the Level makes it even more special. I'd warmly recommend staying here. Unforgettable week! Stayed here for a week at the end of October, and we would go back in a heartbeat. The room ( floor 5) has superb views over the bay, spotlessly clean, comfy beds- everything you would expect from a 5* hotel. Food was amazing, and the staff were so welcoming and friendly that it felt like it was a small boutique hotel rather than a large hotel.